Named for the Scottish folk hero, Rob Roy MacGregor, the Rob Roy is similar to the Manhattan, but uses a Scotch Whisky rather than Rye or Bourbon. The Rob Roy gives Scotch drinkers another option from the traditional Scotch and soda. Made with a combination of Scotch Whisky, vermouth and (sometimes) bitters, it is not surprising that it is often referred to as the Scotch Manhattan. 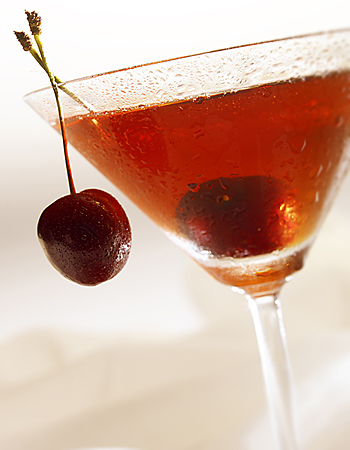 The Rob Roy made its first appearance in the US around 1894 at the Waldorf-Astoria Hotel in New York City. The introduction was two-fold: the American launch of Dewar’s Scotch Whisky, and an Opera that opened near the Waldorf carrying the drink’s namesake. Once it had made its debut, the new classic was here to stay. The cocktail gets its name from Rob Roy MacGregor, a Scottish folk hero and outlaw. It’s hard to say exactly why the drink is named for the Scottish Robin Hood, but there are two possible reasons. The first, and most likely, is that because the drink is made with Scotch, the originator of the drink chose a famous Scotsman as its namesake. Also possible is that because the McGregor was known to have red hair, and the Rob Roy has an amber tint, it seemed only natural to name it for the famous Scotsman. The Rob Roy can be served straight up or on the rocks, depending on the preference of the drinker. For straight up, combine the ingredients in a mixing glass and stir thoroughly. Strain into a cocktail glass and garnish with a cherry. For on the rocks, combine the ingredients over ice in an old-fashioned glass. Garnish with a cherry. While the Rob Roy is traditionally served sweet, it can be ordered dry by substituting dry vermouth for the sweet, or perfect by pouring equal portions of dry and sweet vermouth. For the best taste, be sure to keep the vermouth at a total of 1/4 oz or less. A variation on its own, the Rob Roy is a member of the Manhattan family of cocktails, and has even spurred a variation of itself. Check out some of Rob Roy’s friendly cousins. The only real variation spurred from the Rob Roy. Combine the ingredients over ice in an old-fashioned glass. Garnish with a cherry. Can also be served straight up. Combine the ingredients over ice in an old-fashioned glass. Garnish with a lemon wedge. Can also be served straight up.